Landscape architect Ryan Kettelkamp speaks Thursday at the public meeting for the Clark Street Beach Bird Sanctuary Restoration Project. City officials unveiled a preliminary design for the project at the meeting. City officials unveiled a preliminary restoration design for the Clark Street Beach Bird Sanctuary on Thursday at the restoration project’s second public meeting. 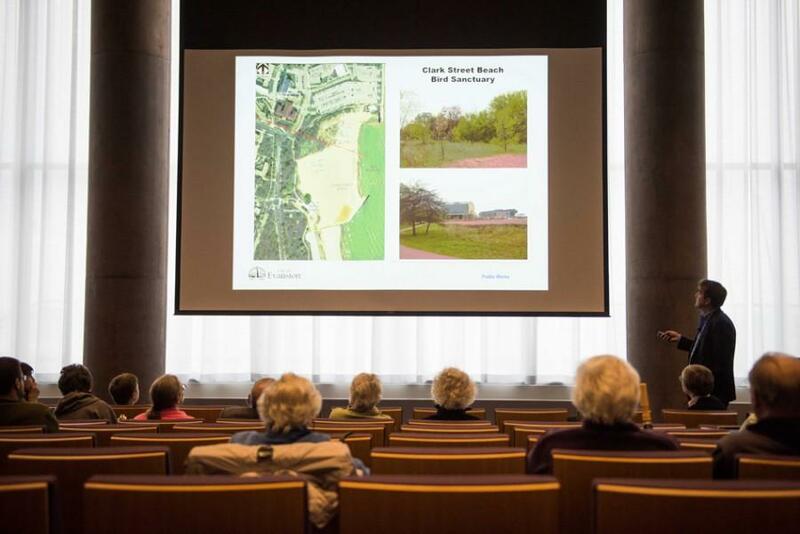 The restoration project aims to restore the bird habitat, which was damaged by the construction of Northwestern’s Segal Visitors Center, 1841 Sheridan Road, where, incidentally, Thursday’s meeting took place. The city’s $173,000 budget for the project comes from a tree replacement fee NU paid after removing 275 trees during the visitor center construction, said Ryan Kettelkamp of Kettelkamp & Kettelkamp Landscape Architecture, the firm selected by the city to lead the project. Kettelkamp said community members who attended April’s meeting requested the firm add a water source for birds, fencing for protection and signage and a maintenance plan for after construction of the sanctuary is complete. Officials involved in the project have begun to refer to the site as a “sanctuary” instead of a “habitat” in response to public input, said Kettelkamp. “We wanted to make sure that we heard you,” Kettelkamp told the audience of about 30 people. Kettelkamp unveiled the possible design for the sanctuary, which is south of the Segal Visitors Center. The design includes new handicap-accessible viewing areas, indented open areas where vegetation can grow, and fencing around the sanctuary. The design also includes space for an information board, but Kettelkamp said funding is not yet available to make that a reality. Overall, the sanctuary will aim to provide food and a “stopping-off point” to the about 280 species of birds that migrate through the Chicago area annually, according to city documents. “We want it to look good, and we don’t want it to look like a bird prison,” Kettelkamp said. Stefanie Levine, the city’s senior project manager, told The Daily that Thursday’s meeting would be the last meeting open to the public, as city officials now need to submit construction designs before beginning the bidding process for contractors in August. Levine said restoration work will begin in the fall. Libby Hill, an Evanston resident involved with the Evanston North Shore Bird Club, told The Daily the project has overcome challenges thanks to community excitement and cooperation between school groups, city officials and community groups. “I would like the entire community to feel that this is their sanctuary, that they’re assisting the birds,” Hill said. Kettelkamp said the community is the leader for the restoration of the bird sanctuary and that volunteers will be called on to maintain the restored area.